tabs one per database, here we have only one database open called AnnotatedGames. Game Board which shows the current position of the game being examined. Game Notation shows the current loaded game including comments, variations and symbols etc. Game Explorer shows the list of games in the database and provides functions to explore the database for games. The Game Explorer pane is optional and its presence is toggled using the Database Info icon. Opening Explorer provides multi-source real-time access to opening moves and statistics.The Opening Explorer pane is optional and its presence is toggled using the Book icon. Analysis Explorer provides access to engine analysis with statistics, history and game analysis.The Analysis Explorer pane is optional and its presence is toggled using the Computer icon. 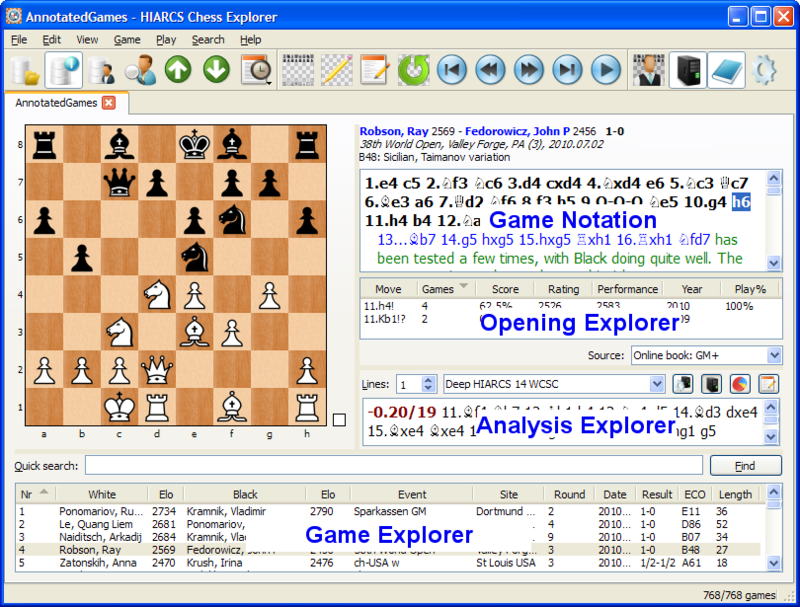 Play game mode provides the ability to play chess against the computer. The height and width of the Game Notation, Opening Explorer and Analysis Explorer panes can be adjusted. The height of the Game Explorer pane can also be adjusted. The chess board will automatically adjust size to fit.